If you are looking for a good fundraiser for your charity or organization, raffles are a great choice. They are fun for everyone, fairly easy to run, and raise good money. But which type of raffle is best for your event? Here’s a review of the different raffle types and their pros and cons for the organizations running them. Before you get started, be sure to check out the raffle laws in your region to be sure that you are eligible to run a raffle and that you are following all necessary rules and restrictions. Standard raffles, also called tombolas in the UK and other areas, are the most common type of raffle. Organizations collect raffle prizes ahead of time and then buy or make raffle tickets to sell. The raffle tickets have two separate parts with the same number printed on them. One part is taped or glued to a prize, and the other goes into a box or bucket to be sold later. The person who buys a ticket with a number on it wins the corresponding prize. Usually, some of the raffle tickets you sell are not winners. Depending on the tickets you choose, you might only assign prizes to specific ticket numbers (like even numbers or numbers ending in zero). In other cases, the raffle tickets include losing tickets along with the numbered tickets. Standard raffles have the advantage that they are easy to run and understand (for the people who are buying your tickets). They can see the available prizes and decide if they are worth the tickets. Keep in mind that the prizes don’t have to be very high-value, which will make it easier to find donors. This type of raffle works best when you have a few high-value prizes. The prizes are put out on a table for everyone to see. In front of each prize, you put out a container to collect tickets (a lidded bucket with a slit cut into the lid or an empty tissue box wrapped in attractive paper with a slot work well for this). People buy tickets and drop them into the container that matches the prize they want to win. When the time is up, a single ticket is drawn from each container to determine the winner. This can be fun for entrants because they can try to improve their odds of winning by trying to win prizes with fewer people entering for them. It’s also a very simple way of giving away big prizes, and this raffle type costs nothing more than a roll of raffle tickets. It can be time-consuming and confusing if you have a large number of prizes, though. 50/50 raffles are quick and easy to run. You don’t even need to organize prizes in advance, though a roll of raffle tickets will make things easier. This type of raffle is cash-based only. Participants buy tickets and all the money is put into a prize pool. 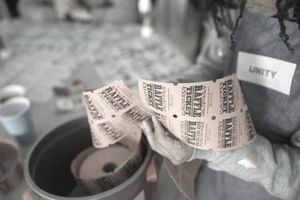 When the tickets have been sold, a single ticket is drawn as the winner. Half of the cash goes to the winner and the other half stays with the organization. This is hands-down one of the easiest types of raffle to run. You don’t have to do any preparation in advance, you don’t need a lot of room to display prizes, and it doesn’t take long to distribute the prizes. On the downside, this may feel more like gambling than playing a game to some people, which could make them uncomfortable. If a certain amount of money is collected, you might also need to report the giveaway to the IRS or withhold money for taxes. The basic idea behind this type of raffle is that your organization offers a game board consisting of a grid of squares. The grid can be set up in a checkerboard style, or it can be superimposed over a treasure map or other image. Participants buy squares for whatever rate your organization sets. You can have some areas of the map correspond to different prizes and charge different rates for different areas. Once they have bought a square, the participant usually writes their names into that square. The winning squares have been pre-determined and will be announced at the end of the giveaway. Another option is to cover the squares with a film that participants can peel off to see if they have won, turning this raffle into a type of instant-win game. The nice thing about this kind of raffle is that your organization can set up the board in advance and let people buy squares over time. It also makes a fun addition to something like a charity dinner or a Super Bowl bash. Raffles are a flexible way to raise a good amount of money for your good cause. Plus, there are a wide variety of raffle types to choose among, so that you can tailor your fundraiser to your own situation.